I'm replacing the horn on my 77 but I need a real basic how to on how to wire up a 4 terminal relay for it. I know the #30terminal will go to the battery for power but I'm confused at how to wire the rest of the relay. The original horn has just the two wires going to it and the replacement Ford horn also has two wires running to it. Thanks in advance. The two wires feeding the original bike horn will instead energize the relay coil, the remaining relay connection supplies switched power from the battery to your Ford horn positive terminal, Ford horn ground terminal will connect to bike ground. Sorry I don't have a relay in front of me to give you the terminal #'s but I think they also have symbols on them indicating which terminals are switch contact and which are coil terminals. So when you push the horn button, the bike horn circuit energizes the relay coil and the switch contacts in the relay put battery power to the Ford horn. Don't forget to put a 15 amp fuse at the battery for the power source to the relay. This should help you find the terminals. the original horn wires go to #85 & #86, which is which, don't matter. #87 supplies switched 12VDC to the Horn.... the frame is grounded to supply the negative side of the battery power. I will suggest putting the fused battery connection to terminal #87.If #30 is used,the center blade #87a will have power on it when the relay is NOT energized. Just a safety thing...no sparkies..
John and Denver Winger. I know you guys know what you mean but see if I can regurgitate it back before I burn something up. BTW I only have a 4 terminal relay so terminal #87a isn't on my relay. The two wires coming out of the horn, a Black one and a Light Green will go to Terminals #85 and #86. (That makes sense now that I see that part of the relay handles the increased load.) I'll then run a heavy wire from #30 fused to my battery. I think that part is straight forward now. You probably all knew this but the light green wire to the horn is only grounded when you push the horn button. What I'm still confused about is what to do with both of the wires that come from the bike's harness? Is it the one with power, a White w/Green Stripe, that then goes to #87? So the old light green wire (it may be a slightly different color) that went to ground isn't used? I take it I don't need to run a separate ground wire from the horn to the frame? Guys, sorry to confuse this issue but I just found this explanation and how to wire a relay for the horn. I underlined the part this fellow telling how to wire the relay. I may have misunderstood your explanations. This gentleman says to take the two wires "running to the horns" and put them on #85 and #86 Then run one wire from the horn to #87. The second horn wire is then run to ground. A relay is simply an electrically operated, heavy duty switch. Relays are used in applications where an electric device draws a large amount of current. With a relay installed, the wire size to the primary switch, and the switch itself can be constructed for a small current draw. Heavy wire is run from the battery to the relay contacts and then to the device. In motorcycle applications we use relays for powering accessory horns that would draw more current than our horn pushbutton and associated wiring can handle. Most general purpose relays have a set of normally open contacts and a set of normally closed contacts and are wired internally as shown to the left. They have two pins for powering the relay coil (85 and 86), a pin for main power in (30), and two pins for main power out. One of the power out pins is through the normally open contacts (87A) and the other pin is through the normally closed contacts (87). Some relays reverse the 87 and 87A markings. Relays work like this: Power is sent through the relay coil which becomes an electromagnet. A small iron rod or bar is pulled by the magnetic field towards the coil and in turn pulls one set of contacts open and the other set of contacts closed. The relay therefore can be used to open a circuit or close a circuit depending on which pins are used. For horn applications we use the normally open contacts, so that when the coil is energized by pushing the horn button, it pulls the contacts closed, completing the circuit from the battery to a horn or air compressor. If your relay is unmarked you can still figure out the pins. Start by finding the pins connected to the N.C. contacts. Use an ohmmeter to find two pins with zero resistance between them. Mark these 30 and 87. Then find the pins that are connected to the coil which will have some resistance. Mark them 85 and 86. The remaining pin is one of the N.O. contacts. Number it 87A. One thing remains. You know which pins are the N.C. contacts (30 and 87) but you do not know which one is pin 30 for the power. This DOES matter. Temporarily connect coil pin 85 to ground and pin 86 to positive 12 volts, but be sure to use an inline fused wire in case you have a mistake. It does not matter which you have marked 85 and 86. As you put power on and off the coil you should hear the relay clicking in and out. If so proceed. (If the fuse blows, you have pins 30 and 87 not 85 and 86). Temporarily connect positive 12 volts (again through a fuse) to what you think is pin 30 and connect a test light from pin 87A to ground. The light should be off. Then energize the coil and the light should come on. If this works you have identified all the right connections. If the light does not come on at all, then you have connected power to pin 87 instead of 30. Move your power source to the other pin and try again. All should work. If the light still does not come on, the relay may be faulty. For relays with only four pins it is quite simple. Find the two pins that have continuity. These are the coil pins, the remaining two are the N.O. contacts. It doesn't matter which one of the N.O. contact pins you connect the main power to. It works just like an on/off switch. The stock horns have two wires coming to them. One is the hot line and the other is a ground wire. Within this circuit is the horn pushbutton (a switch). The easiest thing to do is connect the two wires that went [/quote]to the stock horns[/quote], to the relay coil pins. Now run a fused line from your battery positive post to pin 30. The 10 amp inline fuse holder should be as close to the battery as possible, because you don't want six feet of unprotected wire running under the seat, through the frame etc. to the fuse. If the insulation rubs through you have a direct short across the battery. This applies any time you are running a hot line for something on your bike. Run another wire from pin 87 (N.O.) to the horn or compressor. The other pin on the horn or compressor is run to a frame ground. All wiring on the horn side of the relay should be a minimum 12 guage wiring. One final note. The 75 to 83 Goldwing (and most likely many other bikes) have the horn button located in the GROUND leg of the circuit. This has confused many back yard mechanics, including the writer. To check for this, disconnect the two wires from your stock horn. Turn your key on and put a 12 volt test light between one connector and a frame ground. Do the same with the other connector. If either one energizes the test light, your horn switch is on the ground side. That is why you use both wires that went to the stock horns for the relay coil. If you just run the hot line to the relay coil and then to a frame ground, your horns will be constantly on whenever your key is on. Some neighbours get annoyed by this! Good luck and enjoy your new horns! Copyright © May 1996 by Duane Knodel. All Rights Reserved. If you follow the part that you have underlined, you will be good. 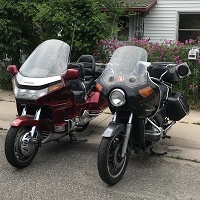 Ultimately, what it is saying is that the two wires which come out of the bikes harness and go to the original horn, are disconnected from the horn and, instead, connected to #85 and #86 on the relay (doesn't matter which way round). If you take this step and then turn on ignition, when you press the horn button the relay will click each time you press the button. It is then a simple case of running a heavy wire from battery positive (fused near the battery) to relay pin #30. Another heavy wire is then run from pin #87 on the relay to one contact on the horn. The final connection required is to run another wire from the second contact on the horn to frame ground. Thanks Maz and everyone. I hope to get to this today if all goes well! SUCCESS! After a lot of hand holding you guys finally got through to me on how to wire a horn relay. Your explanations along with the article by Duane Knodel another site did the trick from. When I finally knew what how to wire it I sketched it out and then made a bracket for the horn and started to attach the terminals to the wires. I discovered you could buy a junction block with pigtails on it for a 4 or 5 terminal relay, so for $5 from Advance Auto I bought one. (You can also buy a relay and junction block together but I already had the relay.) I thought it would make a much better looking job. If I hadn't already attached the top shelter cover I would have drilled and mounted the relay just in front of the air box. I opted for the frame with wire ties plus I can get to it easily if I have to. I now have a nice load Fiamm horn from a Ford. Glad you got it sorted. It's not hand-holding, it's just like-minded people helping each other out. 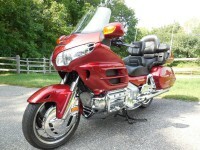 We all need assistance at one time or other and when it comes to Goldwings, we know where to go. Good luck with your ride.